I’ve had the yellow and lavender one for quite a while now. I never feed it and it doesn’t seem to mind. It has a different form than most mags I see. I’m hoping it decides to split at some point but maybe it won’t without feeding. The other one I just got about 6 weeks ago. It was totally white with a pink/purple base (depending one the lighting) on arrival. I was hoping it was going to end up with green tentacles but it’s not looking like it at this point. I think it’s close to its final color but still a bit bleached. They look great! Can you share pics of your gigs too? I see a couple of green ones. Bigger one in the back has shorter tentacles for some reason. Just never seems to get any longer. I’ve had it for over a year. The smaller one up front I got pretty recently and the tentacles grew within a month. Bigger one also has more of a brown foot while the smaller one has the blue that I usually see on gigs. Both the mags and gigs are looking fantastic, wow! Where did you get them? Are you in south Florida by chance? Do you have any other gigs in your tank? Have you noticed the green ones getting smaller in size? My green gigs have slowly gotten smaller over time, and I'm trying to figure out why. The other gigs in the tank are fine, and all eat a lot (I'm trying to get them to grow). I'm wondering if the other gigs are using essential nutrients faster than the green ones. Maybe my lighting it too bright? What kind of lights are you using? If LED, how bright are they? Haven’t noticed them getting smaller. The little one is actually growing pretty nicely . My lighting is cheap black boxes. I have the blues near 100% and the whites around 50%. I don’t feed them ever. My bigger green isn’t growing as fast as the little one but I assume the small ones just grow faster naturally than the ones that already have decent size. I never do water tests so I can’t really say anything about parameters. I do a 40% water change about once a month. They’ve been pretty care free. I’m sure my nitrates are high because I feed the tank heavily. Here is one of my favorite residents of the tank. Each gig hosts one. They definitely seem to prefer the gigs When given a choice buyer they do go in the mags occasionally. They don’t seem to tolerate each other well so they keep their distance. They seem to avoid the leopard wrasses and pencil wrasse. At this point the shrimp are probably too big to be eaten anyway. I bought them small and never realized they got so large. They are about the size of an average cleaner shrimp. Great pics and cool vid, nems look awesome! I like the anemone shrimp as well. I have a mag in treatment right now, had the lfs order it for me. Was hoping to get one lavender with yellow tips like the first one pictured but it looks more like the second one. They are both gorgeous though. Really nice . So what are everyone’sinitial steps in acclimating, treating , quarantine etc etc . Do y’all use ciprofloxin no matter what Do y’all drip acclimate . So please lay out steps I should follow in getting a magnificent. I have been waiting for LFS to get some in . They had some in last fall but never pulled the trigger. Do y’all direct water flow directly at them . Is it constant day and night . Does it alternate? Or random? I definitely plan on treating all mags and gigs (even though I’ve had little if any success saving sick gigs), but I usually give them a day before starting treatment if they look good on arrival. Just to see if I get lucky and don’t have to treat. I never drip acclimate anything. I feel that it it pretty pointless. I let them attach with little to no flow and then give them decent but not too intense flow until they are really settled in. After that you can blast them pretty good but I still put my power heads in night mode to give them and the fish a bit of a break. 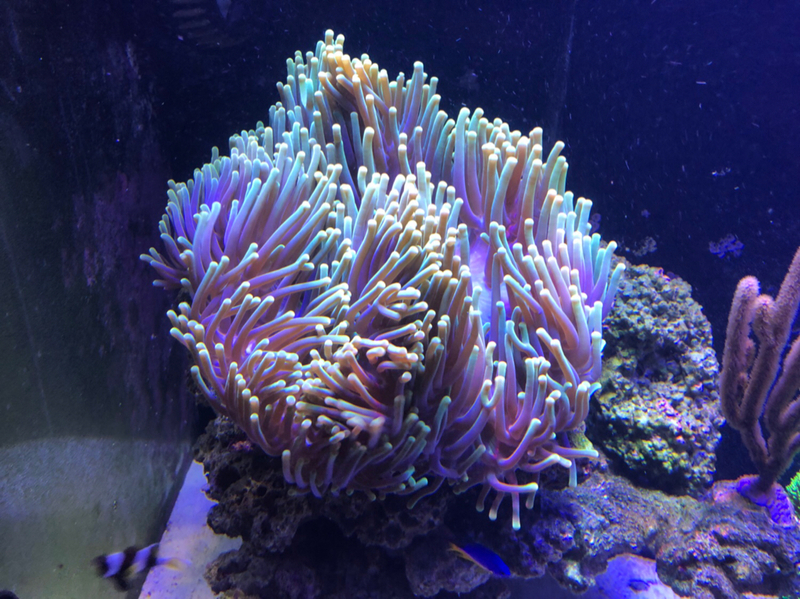 I probably don’t have as much flow in my tank as most people with mags and gigs anyway though. I feel like as long as the flow is strong enough to carry waste away from the nems you are probably ok. These 3 are doing well. Came in at the wholesaler in great condition. No treatment was needed. They are in a 30 for now but eventually I'll move them to a larger tank. The PNG percs lightened up when they began hosting in the mags. I believe they would get darker in a gigantea or mertens. I'm looking for a few merten's but they are hard to find. Excuse the poor photo quality. I'm having problems posting photos and videos. pfan151. Beautiful anemones. And very health. Yea. My purple and lavender one doesn’t seem to have the typical upright type form. I ususally can not see the base at all on that one. Just looks like a big mass of tentacles coming out of the rock. Tentacles seem thicker and more uniform also, without much of a bulb at the tip like I see with most. That's exactly how mine is. Almost never see the base. I wonder if it's a certain strain.